Bull heads excavated from Çatalhöyük in the Museum of Anatolian Civilizations in Ankara. 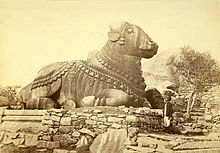 17th century sculpture of a Nandi bull in Mysore. Numerous peoples throughout the world have at one point in time honored bulls as sacred. In Sumerian mythology, Marduk is the "bull of Utu". In Hinduism, Shiva's steed is Nandi, the Bull. The sacred bull survives in the constellation Taurus. The bull, whether lunar as in Mesopotamia or solar as in India, is the subject of various other cultural and religious incarnations as well as modern mentions in New Age cultures. Aurochs are depicted in many Paleolithic European cave paintings such as those found at Lascaux and Livernon in France. Their life force may have been thought to have magical qualities, for early carvings of the aurochs have also been found. The impressive and dangerous aurochs survived into the Iron Age in Anatolia and the Near East and were worshipped throughout that area as sacred animals; the earliest survivals of a bull worship are at neolithic Çatalhöyük. The bull was seen in the constellation Taurus by the Chalcolithic and had marked the New Year at springtide by the Bronze Age, for 4000–1700 BCE. Hathor as a cow, wearing her necklace and showing her sacred eye on the Papyrus of Ani. In Egypt, the bull was worshiped as Apis, the embodiment of Ptah and later of Osiris. A long series of ritually perfect bulls were identified by the god's priests, housed in the temple for their lifetime, then embalmed and encased in a giant sarcophagus. A long sequence of monolithic stone sarcophagi was housed in the Serapeum, and was rediscovered by Auguste Mariette at Saqqara in 1851. The bull was also worshipped as Mnevis, the embodiment of Atum-Ra, in Heliopolis. Ka in Egyptian is both a religious concept of life-force/power and the word for bull. We cannot recreate a specific context for the bull skulls with horns (bucrania) preserved in an 8th millennium BCE sanctuary at Çatalhöyük in eastern Anatolia. The sacred bull of the Hattians, whose elaborate standards were found at Alaca Höyük alongside those of the sacred stag, survived in Hurrian and Hittite mythology as Seri and Hurri ("Day" and "Night"), the bulls who carried the weather god Teshub on their backs or in his chariot and grazed on the ruins of cities. Bulls were a central theme in the Minoan civilization, with bull heads and bull horns used as symbols in the Knossos palace. Minoan frescos and ceramics depict bull-leaping, in which participants of both sexes vaulted over bulls by grasping their horns. The Iranian language texts and traditions of Zoroastrianism have several different mythological bovine creatures. One of these is Gavaevodata, which is the Avestan name of a hermaphroditic "uniquely created (-aevo.data) cow (gav-)", one of Ahura Mazda's six primordial material creations that becomes the mythological progenitor of all beneficent animal life. Another Zoroastrian mythological bovine is Hadhayans, a gigantic bull so large that it could straddle the mountains and seas that divide the seven regions of the earth, and on whose back men could travel from one region to another. In medieval times, Hadhayans also came to be known as Srīsōk (Avestan *Thrisaok, "three burning places"), which derives from a legend in which three "Great Fires" were collected on the creature's back. Yet another mythological bovine is that of the unnamed creature in the Cow's Lament, an allegorical hymn attributed to Zoroaster himself, in which the soul of a bovine (geush urvan) despairs over her lack of protection from an adequate herdsman. In the allegory, the cow represents humanity's lack of moral guidance, but in later Zoroastrianism, Geush Urvan became a yazata representing cattle. The 14th day of the month is named after her and is under her protection. Bulls also appear on seals from the Indus Valley Civilisation. Nandi appears in Hindu mythology as the primary vehicle and the principal gana (follower) of Shiva. In Rig Veda, Indra was often praised as a Bull (Vrsabha – 'vrsa' means he and bha means being or uksan- a bull aged five to nine years, which is still growing or just reached its full growth), with bull being an icon of power and virile strength not just in Aryan literature but in many IE cultures. In Cyprus, bull masks made from real skulls were worn in rites. Bull-masked terracotta figurines and Neolithic bull-horned stone altars have been found in Cyprus. The Canaanite (and later Carthaginian) statue to which sacrifices were burnt, either as a deity or a type of sacrifice – Moloch – was referred to as a horned man, and likened to Cronus by the Romans. There may be a connection between sacrifice to the Cretan horned man Minotaur and Cronus' himself. Both Baʿal and El were associated with the bull in Ugaritic texts, as it symbolized both strength and fertility. Cronus' son Zeus was raised on Crete in hiding from his father. Having consumed all of his own children (the gods) Cronus is fed a boulder by Zeus (to represent Zeus' own body so he appears consumed) and an emetic. His vomiting of the boulder and subsequently the other gods (his children) in the Titanomachy bears comparison with the volcanic eruption that appears to be described in Zeus' battle with Typhon in the Theogony. Consequently, Cronus may be associated with the eruption of Thera through the myth of his defeat by Zeus. The later association between Canaanite religions in which child sacrifice took place Ezek. 20:25-26 and the association of child sacrifice with a horned god (as potentially on Crete and certainly in Carthage) may also be connected with the Greek myth of sending young men and women to the Minotaur, a bull-headed man. Exodus 32:4 "He took this from their hand, and fashioned it with a graving tool and made it into a molten calf; and they said, 'This is your god, O Israel, who brought you up from the land of Egypt'." Nehemiah 9:18 "even when they made an idol shaped like a calf and said, 'This is your god who brought you out of Egypt!' They committed terrible blasphemies." Calf-idols are referred to later in the Tanakh, such as in the Book of Hosea, which would seem accurate as they were a fixture of near-eastern cultures. Solomon's "Molten Sea" basin stood on twelve brazen bulls. Young bulls were set as frontier markers at Dan and Bethel, the frontiers of the Kingdom of Israel. Much later, in Abrahamic religions, the bull motif became a bull demon or the "horned devil" in contrast and conflict to earlier traditions. The bull is familiar in Judeo-Christian cultures from the Biblical episode wherein an idol of the golden calf ((Hebrew: עֵגֶּל הַזָהָב‎) is made by Aaron and worshipped by the Hebrews in the wilderness of the Sinai Peninsula (Book of Exodus). The text of the Hebrew Bible can be understood to refer to the idol as representing a separate god, or as representing Yahweh himself, perhaps through an association or religious syncretism with Egyptian or Levantine bull gods, rather than a new deity in itself. Among the Twelve Olympians, Hera's epithet Bo-opis is usually translated "ox-eyed" Hera, but the term could just as well apply if the goddess had the head of a cow, and thus the epithet reveals the presence of an earlier, though not necessarily more primitive, iconic view. (Heinrich Schlieman, 1976) Classical Greeks never otherwise referred to Hera simply as the cow, though her priestess Io was so literally a heifer that she was stung by a gadfly, and it was in the form of a heifer that Zeus coupled with her. 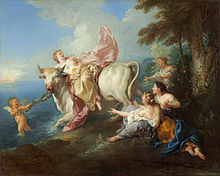 Zeus took over the earlier roles, and, in the form of a bull that came forth from the sea, abducted the high-born Phoenician Europa and brought her, significantly, to Crete. Dionysus was another god of resurrection who was strongly linked to the bull. In a worship hymn from Olympia, at a festival for Hera, Dionysus is also invited to come as a bull, "with bull-foot raging." "Quite frequently he is portrayed with bull horns, and in Kyzikos he has a tauromorphic image," Walter Burkert relates, and refers also to an archaic myth in which Dionysus is slaughtered as a bull calf and impiously eaten by the Titans. For the Greeks, the bull was strongly linked to the Cretan Bull: Theseus of Athens had to capture the ancient sacred bull of Marathon (the "Marathonian bull") before he faced the Minotaur (Greek for "Bull of Minos"), who the Greeks imagined as a man with the head of a bull at the center of the labyrinth. Minotaur was fabled to be born of the Queen and a bull, bringing the king to build the labyrinth to hide his family's shame. Living in solitude made the boy wild and ferocious, unable to be tamed or beaten. Yet Walter Burkert's constant warning is, "It is hazardous to project Greek tradition directly into the Bronze Age." Only one Minoan image of a bull-headed man has been found, a tiny Minoan sealstone currently held in the Archaeological Museum of Chania. In the Classical period of Greece, the bull and other animals identified with deities were separated as their agalma, a kind of heraldic show-piece that concretely signified their numinous presence. Tauroctony of Mithras at the British Museum, London. Bull used as a heraldic crest, here for the Fane family, Earls of Westmorland. (Great Britain, this example 18th or 19th century, but inherited early 17th century from a much earlier use of the idiom by the Neville family). The religious practices of the Roman Empire of the 2nd to 4th centuries included the taurobolium, in which a bull was sacrificed for the well being of the people and the state. Around the mid-2nd century, the practice became identified with the worship of Magna Mater, but was not previously associated only with that cult (cultus). Public taurobolia, enlisting the benevolence of Magna Mater on behalf of the emperor, became common in Italy and Gaul, Hispania and Africa. The last public taurobolium for which there is an inscription was carried out at Mactar in Numidia at the close of the 3rd century. It was performed in honor of the emperors Diocletian and Maximian. Another Roman mystery cult in which a sacrificial bull played a role was that of the 1st–4th century Mithraic Mysteries. 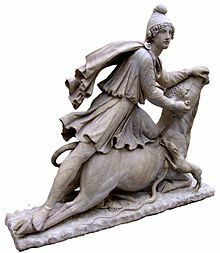 In the so-called "tauroctony" artwork of that cult (cultus), and which appears in all its temples, the god Mithras is seen to slay a sacrificial bull. Although there has been a great deal of speculation on the subject, the myth (i.e. the "mystery", the understanding of which was the basis of the cult) that the scene was intended to represent remains unknown. Because the scene is accompanied by a great number of astrological allusions, the bull is generally assumed to represent the constellation of Taurus. The basic elements of the tauroctony scene were originally associated with Nike, the Greek goddess of victory. Macrobius lists the bull as an animal sacred to the god Neto/Neito, possibly being sacrifices to the deity. A prominent zoomorphic deity type is the divine bull. Tarvos Trigaranus ("bull with three cranes") is pictured on reliefs from the cathedral at Trier, Germany, and at Notre-Dame de Paris. In Irish mythology, the Donn Cuailnge plays a central role in the epic Táin Bó Cúailnge ("The Cattle Raid of Cooley"), which features the hero Cú Chulainn, which were collected in the seventh century Lebor na hUidre ("Book of the Dun Cow"). The druids — that is what they call their magicians — hold nothing more sacred than the mistletoe and a tree on which it is growing, provided it is Valonia oak…. Mistletoe is rare and when found it is gathered with great ceremony, and particularly on the sixth day of the moon….Hailing the moon in a native word that means ‘healing all things,’ they prepare a ritual sacrifice and banquet beneath a tree and bring up two white bulls, whose horns are bound for the first time on this occasion. A priest arrayed in white vestments climbs the tree and, with a golden sickle, cuts down the mistletoe, which is caught in a white cloak. Then finally they kill the victims, praying to a god to render his gift propitious to those on whom he has bestowed it. They believe that mistletoe given in drink will impart fertility to any animal that is barren and that it is an antidote to all poisons. The practice of bullfighting in the Iberian Peninsula and southern France are connected with the legends of Saturnin of Toulouse and his protégé in Pamplona, Fermin. These are inseparably linked to bull-sacrifices by the vivid manner of their martyrdoms set by Christian hagiography in the third century. Taurus (Latin for "the Bull") is one of the constellations of the zodiac, which means it is crossed by the plane of the ecliptic. Taurus is a large and prominent constellation in the northern hemisphere's winter sky. It is one of the oldest constellations, dating back to at least the Early Bronze Age when it marked the location of the Sun during the spring equinox. Its importance to the agricultural calendar influenced various bull figures in the mythologies of Ancient Sumer, Akkad, Assyria, Babylon, Egypt, Greece, and Rome. ^ Jules Cashford, The Moon: Myth and Image 2003, begins the section "Bull and cow" pp 102ff with the simple observation, "Other animals become epiphanies of the Moon because they look like the moon.... the sharp horns of a bull or cow were seen to match the pointed curve of the waxing and waning crescents so exactly that the powers of the one were attributed to the other, each gaining the other's potency as well as their own." ^ Miller, Patrick (2000), Israelite Religion and Biblical Theology: Collected Essays, Continuum Int'l Publishing Group, p. 32, ISBN 1-84127-142-X . ^ "Hosea 10:5 The people who live in Samaria fear for the calf-idol of Beth Aven. Its people will mourn over it, and so will its idolatrous priests, those who had rejoiced over its splendor, because it is taken from them into exile". Bible.cc. Retrieved 2012-10-30. ^ "1 Kings 7:25 The Sea stood on twelve bulls, three facing north, three facing west, three facing south and three facing east. The Sea rested on top of them, and their hindquarters were toward the center". Bible.cc. Retrieved 2012-10-30. ^ "Jeremiah 52:20 The bronze from the two pillars, the Sea and the twelve bronze bulls under it, and the movable stands, which King Solomon had made for the temple of the LORD, was more than could be weighed". Bible.cc. Retrieved 2012-10-30. Campbell, Joseph Occidental Mythology "2.The Consort of the Bull", 1964. Jeremy B. Rutter, The Three Phases of the Taurobolium, Phoenix (1968). Heinrich Schliemann, Troy and its Remains (NY, Arno Press, 1976) pp. 113–114. An exhibit on the tombs of Alaca Höyük at the Metropolitan Museum of Art includes one example of the bull standards. Bull Tattoo Art The image of the bull in tattoo art.